Camp Runamuck: Let the Threading Begin! Well, it took a Herculean effort to get a Herculean loom warped and ready to thread. I will say that Eugene Textile Center redeemed themselves by actually having the 63" long Glimakra lease sticks in stock and had them to me in 32 hours of calling. I'm impressed. 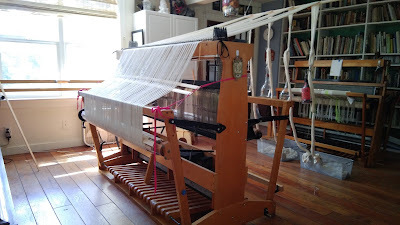 Yesterday I spent close to 3 hours separating the warp into inch segments and winding it on, all 16 yards of it. I lost about 3/4 of a yard at the end. Things got a wee bit snarled and rather than spend a ton more time I literally, cut my losses. I'm sure 15.25 yards will be plenty. 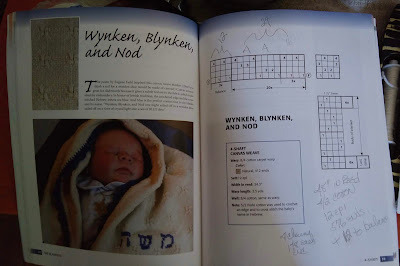 I'm using this canvas weave draft from Tom Knisely's blanket book. Lots of threading to do. Unmercerized 4/2 cotton at 12 dpi. A whole heap of cutting went on early Sunday morning too. I am trying a heavily modified version of the Style Arc Jodi jumper. I'm doing this as a top just to see how it works out. A couple of oldies worked themselves into the cutting pile. A pair of deep pink trousers in my custom pattern. 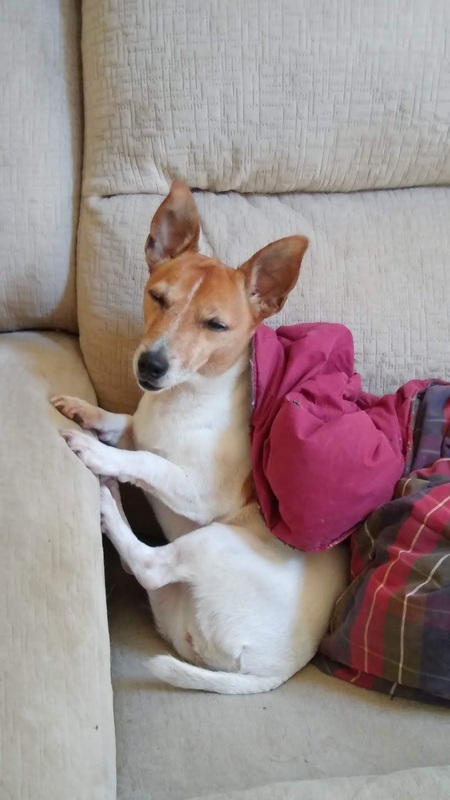 It has a wide straight leg and is so in style right now. The other oldie was the Merchant & Mills Top 64. 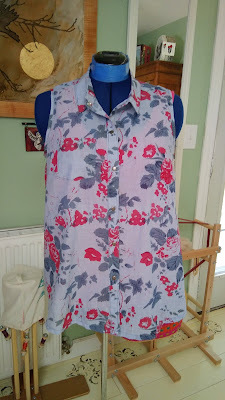 This raglan sleeve pattern has always worked well for me and I found myself wanting another in some bright floral cotton I had picked up last week at a fabric sale, Rounding out the cutting was a new pattern, the Cheyenne Tunic and Blouse. 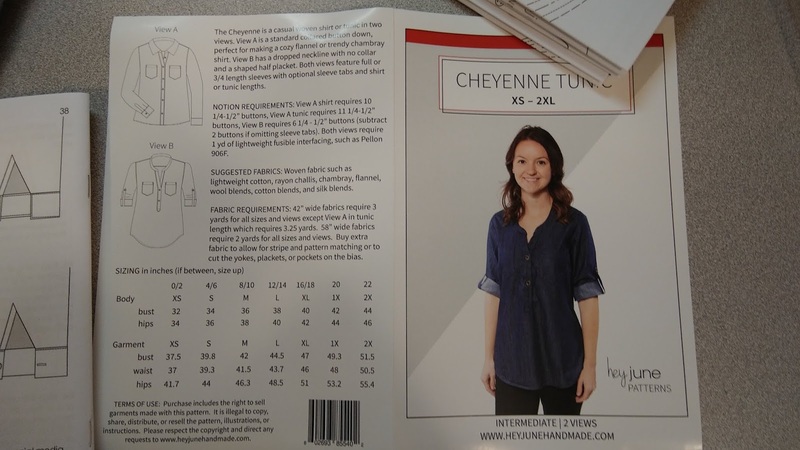 I did the button down version and am fooling with wide cuffs and a hidden button placket. 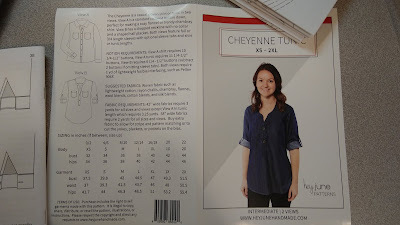 I'm hoping the shoulder and sleeve fit is more to my liking than the Phoebe by Style Arc. We'll see. Another version of Cashmerette's Springfield top got cut out from one of the fabrics from India. 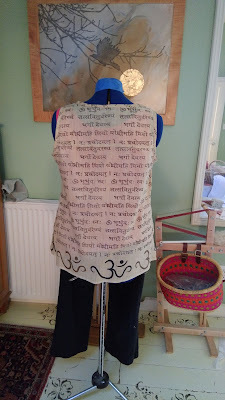 I was thrilled that it had a version with a simple back and yoke so I could preserve the text of the fabric. Cut like this I also preserved the border and didn't need to hem. Win win! It will be a pretty little fall tank too with a black cardi I think. 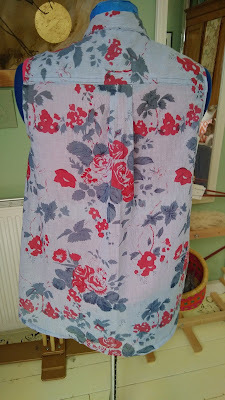 The last of the cut Jalie Rose blouse was sewn up and worn on Saturday. It was cool and comfortable. I really like this pattern a lot. 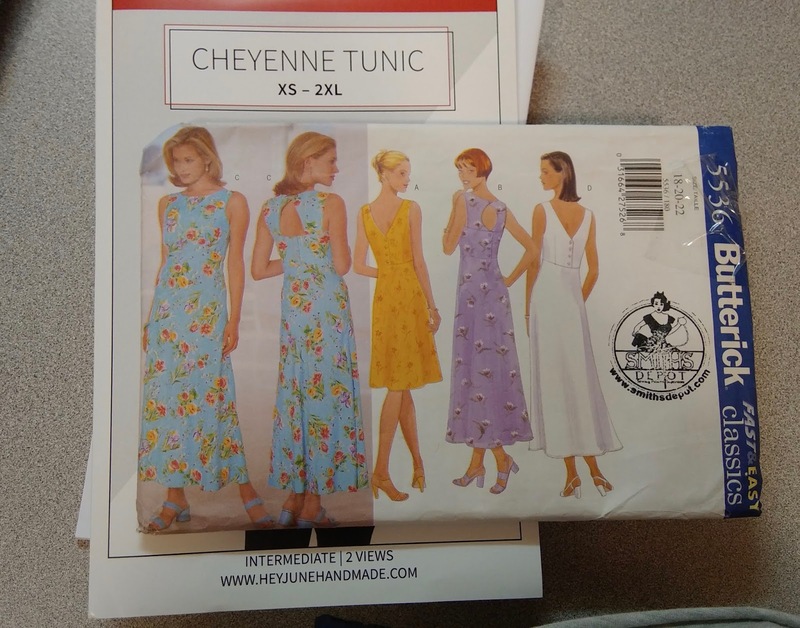 I'm hoping I like this older Butterick Sundress pattern too. I love the back options and I can see this in a much shortened top version too. Worth a shot! So, I wish I had pics, but we have a new slew of wild babies. So far I've seen one fawn and that makes me very happy. I dislike the deer, they are a pain so the fewer the better. Momma Raccoon has again delivered 3 winsome little bandits. They were scrapping around on our deck early Friday morning. This must have been their first outing, they were so small and cute and learned their run and climb lessons quite well. They study me as intently as I study them. Such smart little critters with their piercing black eyes and agile hands and minds. I was able to coax them down with some seed thrown out and a few eggs. Lastly, two turkey hens strutted through Saturday afternoon with about 18 keets between them. Now you know, no matter how many they start with, it always seems they end up with about 4 left by fall. The big fire is contained, although yesterdays thunderstorms ignited numerous fires around the region. We were spared the worst of it but our guys were all out at different lookout points scanning for smoke in the forest. Todays song features some great banjo playing. A very hard instrument to master. My Dad use to play one many moons ago. Parting shot: Just sitting and thinkin'...about balls no doubt! She heard me think "Timmy"! Just making sure my comments get to me. The fix doesn't seem to last. Blogger, a pox on you! Oh, Boy!!! Lots going on in the sewing studio!!!! Congrats on getting the warp on your loom...I love that draft from Tom's book. Wow! 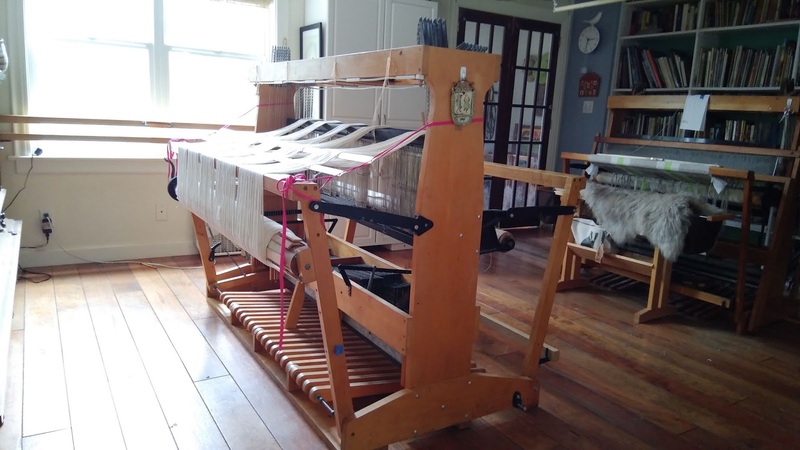 That loom is HUGE! Just too big for me. I learned (the hard way, of course) that I don't function well with more than about a 36" width. So be it. I can do double width doubleweave if needed. But I will anxiously await your weaving output. I would have cut off that last 3/4 yard, too. As Laura Fry says, it's just string. Your time and sanity are worth more than the cotton. 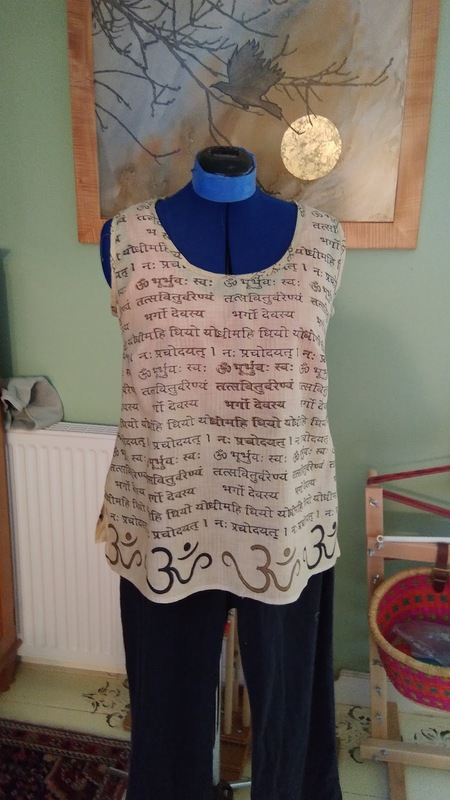 That Indian textile with the writing and Om symbol is GREAT!!! 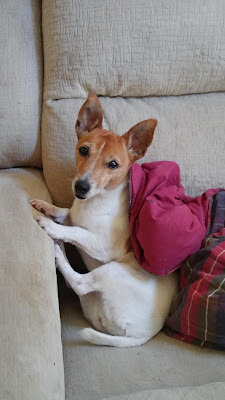 Isn't it amazing how well the dogs hear us think?! It's good to "visit" you; some sanity in this mad, mad world. Such cute tops; I have trouble finding sleeveless ones that fit, are comfortable, and look good. Well, if I am a sane voice we are all in serious trouble...oh wait we're there already. The news is simply stunning isn't it. I have avoided it lately burying myself deep (state?) in a fantasy audible trilogy. I've had good luck recently with sleeveless stuff. 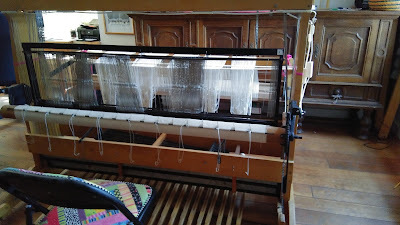 I love a big loom! So many possibilities! The tops came our really well too. Pretty and comfy looking. I'm glad you had pictures because you are writing in a foreign language...I think I may put 'learn to weave' at the bottom of my bucket list, since my math skills - already challenged - are not getting stronger. You are a fashion force! I love that print from India - perfect placement! Don't you wonder how they can be comfortable in the positions they work themselves into? And we can grow and preserve all our own food (prunes, Susan!!!) and go on horseback rides together! If I spin your yarn, will you sew my clothes? I'm fascinated by your warping method. It looks like a good way since that loom doesn't have a sectional beam on it. One of these days I'll make it up to watch you warp it! I, too, love the India fabric, and truly love how prolific you are! The last two photos just made my day, thanks! WOW!!! What a great loom! I've really got to learn to weave. Do you listen to Mumford and Sons? They feature a banjo in their mix. I like them a lot. Hey Kris! Good to see you here!! I really use the same method Jane Stafford uses on Louet looms. They have the raddle on the castle so I mimic that when I warp back to front. Isn't Stella just the cutest? I love that textile too. Do you order fabric directly from India? I was in India in January and brought back yardage which is still waiting to be used! If you order directly, would you share the store?